State Route 60 (SR 60) is an east-west state highway in the U.S. state of California. It runs from the East Los Angeles Interchange near downtown Los Angeles to an interchange with Interstate 10 (I-10) in Beaumont. The highway serves the cities and communities on the eastern side of the Los Angeles metropolitan area and runs along the south side of the San Gabriel Valley. The highway provides a route across several spurs of the Peninsular Ranges, linking the Los Angeles Basin with the Pomona Valley and San Gabriel Valley. It runs from the East Los Angeles Interchange near the Los Angeles River in Los Angeles with Interstate 5 (I-5), Interstate 10 (I-10) and U.S. Route 101 (US 101) east to I-10 in Riverside County, with overlaps at State Route 57 and Interstate 215. The highway runs roughly parallel to Interstate 10, functioning as a bypass alternate east-west route through the area. SR 60 begins at the East Los Angeles Interchange near downtown Los Angeles, designated as the Pomona Freeway. The freeway heads east from the junction after splitting off from the Santa Monica Freeway (I-10) and passes through East Los Angeles, intersecting the Long Beach Freeway (I-710). Continuing east through the southern San Gabriel Valley, SR 60 passes through many cities and communities, intersecting the San Gabriel River Freeway (I-605) in the City of Industry. It proceeds to an overlap with the Orange Freeway (SR 57) in Diamond Bar, right on the edge of the San Gabriel Valley. A short overlap carries SR 60 traffic on the same roadway as SR 57. The two routes head northeast through an arm of the San Gabriel Valley; after they split, SR 60 ascends slightly and then slopes through the Puente Hills and into the Pomona Valley. Continuing east, SR 60 intersects the Chino Valley Freeway (SR 71) in Pomona, the Ontario Freeway (I-15) in Jurupa Valley, and the Riverside Freeway (SR 91/I-215) in Riverside, California. A short overlap carries SR 60 traffic on the same roadway as I-215. The two routes head southeast; after this, SR 60 is designated as the Moreno Valley Freeway. The freeway runs through communities further east in the Inland Empire. After passing through Moreno Valley, SR 60 runs through the rugged hill country to the east (known as the Badlands to the locals). After that, SR 60 downgrades to an expressway, and has with several at-grade interchanges with local roads. Finally, in Beaumont, SR 60 ends and merges into the Christopher Columbus Transcontinental Highway (I-10). SR 60 traverses Los Angeles, San Bernardino, and Riverside Counties. As it passes through many of Los Angeles' east side suburbs in southern San Gabriel and Pomona Valleys, it is a major transportation corridor. For the majority of its length it is generally parallel to, and south of, the San Bernardino Freeway, Interstate 10 (I-10), and generally parallel to, and north of, the Riverside Freeway, California State Route 91. Traffic congestion is exacerbated by the rapid population growth and, therefore, residential, commercial, and industrial development in the inland communities known informally as the Inland Empire. In particular, it has become increasingly clogged of late with shipping container-laden trucks travelling from the ports of Los Angeles and Long Beach to rail yards and warehouses in the Inland Empire. As a result of the rapid development of the Inland Empire since the 1980s, the Moreno Valley Freeway now suffers from severe traffic congestion. In the mid-2000s, the northwestern section that is concurrently signed with Interstate 215 underwent significant construction to improve traffic flow, but it still suffers from heavy congestion. 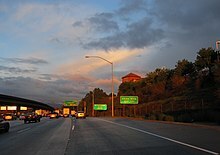 The freeway is known as the Pomona Freeway from its western terminus to its junction with State Route 91 and Interstate 215 in Riverside, and the Moreno Valley Freeway east of this interchange until its eastern terminus at its junction with Interstate 10. The route is part of the California Freeway and Expressway System, and is part of the National Highway System, a network of highways that are considered essential to the country's economy, defense, and mobility by the Federal Highway Administration. The route takes its number from former US 60, which now begins near Brenda, Arizona and terminates on the east coast at Virginia Beach, Virginia. Before 1964, US 60 ran from Los Angeles to the Arizona state line, where it continued its nationwide trek, often overlapping US 99 and US 70 along the way. The advent of I-10 created a situation where, at one point, four different signed routes would run along the state-maintained highway. In 1964, California implemented a plan to simplify its highway-numbering system, where one state highway had only one route number and concurrencies were sternly discouraged. As a result, the US 60 designation (along with US 70 and US 99) was removed. I-10 (as Route 10) superseded US 60's alignment from Beaumont and towards the Arizona state line, even though the routing was only partly a freeway. This left the officially designated Route 60 from Beaumont to Los Angeles orphaned from its original U.S. Highway (which to this day begins at a point on I-10 east of Quartzsite, Arizona). This new Route 60 was provisionally signed as a U.S. Highway since the designation would guide motorists from Los Angeles to Arizona in the absence of a completed freeway for I-10; when all of Route 10 was upgraded to a freeway, the U.S. Highway designation disappeared. At least one California highway sign managed to be overlooked for many years afterward. A sign on Hess Boulevard at SR 62 in the unincorporated town of Morongo Valley pointed not to I-10 but to US 60 (with evidence of the sign having pointed to both US 70 and US 99 as well) stood through the early 2000s; it has since been removed. The stretch of SR 60 along the Moreno Valley Freeway made national headlines in April 2004, when five-year-old Ruby Bustamante of Indio and her 26-year-old mother, Norma, were reported missing. Their car had left the road, apparently unwitnessed, between the gap in two guard rails on April 4. It then crashed underneath a tree in a deep ravine. Though Mrs. Bustamante lost her life, presumably at the moment of impact, Ruby survived on her own for ten days on cups of uncooked Top Ramen noodles and bottles of Gatorade which were in the car. In 1998, the HOV lanes between SR 57 and I-15 opened. In 2005, construction of an HOV lane started between I-605 and Redlands Boulevard in two phases. The construction was finished in 2010 from I-605 to SR 57, and in 2008 from I-15 to Redlands Boulevard. The Grand Avenue (exit 24B) interchange went through some major construction during this period as well, which included adding a direct HOV connector to SR 57 and an alternate route for SR 60 west to exit Brea Canyon Road (exit 23). There are no plans to construct the HOV lanes from I-605 to the East Los Angeles Interchange or from Redlands Boulevard to I-10 at this time. On December 14, 2011, a tanker truck carrying 8,800 US gallons (33,000 l) of gasoline caught fire and exploded on the Pomona Freeway in Montebello; this caused Caltrans to rebuild the Paramount Boulevard overpass. Shortly after the rebuilding of the bridge, Caltrans did widening work on Paramount Boulevard's exit and entrance ramps to accommodate the new bridge and installed new traffic signals. There is also a new connection to the new Monterey Park Market Place via Neil Armstrong Street, a joint venture between the cities of Monterey Park and Montebello, which can be accessed through Paramount Boulevard. In mid-2016, Caltrans started to construct a partial interchange at Lemon Avenue (to Brea Canyon Road) with no westbound exit. The project was to finish in the middle of 2018. On May 1, 2018, the Lemon Avenue eastbound off-ramp exit and westbound on-ramp were opened. The eastbound on-ramp is still under construction. Also, on May 1, 2018, the eastbound off-ramp exit on Brea Canyon Road was removed. The construction of the eastbound on-ramp that provides access to SR 60 from Lemon Avenue has been completed.The Brea Canyon Road eastbound on-ramp will be modified to only include access to SR 57. Another major project will reconstruct the interchange and rebuild the bridge with Grand Avenue on the east to ease bottleneck conditions with the merging of SR 57 north. On the west, the exit ramps are being rebuilt. The eastern portion will begin in 2020. This interchange went through major construction in 2007, but the construction did not make any improvements to the exit ramps. In order to increase safety through the Badlands corridor between Moreno Valley and Beaumont, the Riverside County Transportation Commission (RCTC) is partnering with Caltrans to complete a $138 million project to add a truck climbing lane in each direction between Gilman Springs Road and Jack Rabbit Trail. Construction is expected to begin in summer 2019. There are plans to convert SR 60 from the Jack Rabbit trail exit to its eastern terminus (I-10) to a full freeway. These plans are only in the environmental phase and have not been approved by Caltrans to begin construction. A groundbreaking ceremony was held for the future Potrero Boulevard interchange near the Jack Rabbit Trail exit of SR 60 on February 1, 2018. It is planned to be Exit 75. 22 Lemon Avenue to Brea Canyon Road No westbound exit; eastbound exit and westbound entrance opened on May 1, 2018; eastbound entrance has been completed since late September or early October. 30A[N 2] Fair Isle Drive – Box Springs Westbound exit from SR 60 before merging with I-215 north; No access from I-215 north. ^ a b c d e f g h i Indicates that the postmile represents the distance along I-215 rather than SR 60. ^ a b c d e f g Exit numbers follow I-215 rather than SR 60. ^ a b California Department of Transportation (July 2007). "Log of Bridges on State Highways". Sacramento: California Department of Transportation. ^ California Department of Transportation; California State Transportation Agency (January 2015). 2014 Named Freeways, Highways, Structures and Other Appurtenances in California. Sacramento: California Department of Transportation. p. 48. Archived from the original (PDF) on May 30, 2015. Retrieved May 30, 2015. ^ Federal Highway Administration (March 25, 2015). National Highway System: Los Angeles, CA (PDF) (Map). Scale not given. Washington, DC: Federal Highway Administration. Retrieved October 14, 2017. Federal Highway Administration (March 25, 2015). National Highway System: Riverside–San Bernardino, CA (PDF) (Map). Scale not given. Washington, DC: Federal Highway Administration. Retrieved October 14, 2017. ^ Pugmire, Lance; Sahagun, Louis (April 14, 2004). "Girl Survives 10 Days After Crash Killed Mom Child is found with woman's body and car near bottom of canyon". Los Angeles Times. ^ Hutchinson, Bill (April 15, 2004). "How Miracle Girl Survived". The New York Daily News. ^ Madigan, Nick (April 15, 2004). "5-Year-Old's Survival Tale of 10 Days Alone, Her Mother Dead". The New York Times. ^ "11 miles of carpool lanes on the 60 Freeway formally open Thursday". October 14, 2010. ^ "Tanker fire: Westbound 60 freeway now open, official says". Los Angeles Times. December 17, 2011. ^ Lloyd, Jonathan; Guinyard, Toni; Murphy, Sean. "Bridge to Be Demolished After Tanker Fire". KNSD. ^ "SR-57 / SR-60 Confluence at Grand Avenue Project - Diamond Bar, CA". www.diamondbarca.gov. ^ "RCTC Receives Funding for Truck Lanes on State Route 60". RCTC. August 16, 2018. ^ "Beaumont Breaks Ground On Potrero Interchange". February 2, 2018. ^ a b California Department of Transportation. "State Truck Route List". Sacramento: California Department of Transportation. Archived from the original (XLS file) on June 30, 2015. Retrieved June 30, 2015. ^ California Department of Transportation, California Numbered Exit Uniform System, State Route 60 Freeway Interchanges, Retrieved on 2009-02-05. ^ California Department of Transportation, California Numbered Exit Uniform System, Interstate 215 Freeway Interchanges Northbound and Interstate 215 Freeway Interchanges Southbound, Retrieved on 2009-02-05. ^ "Lemon Avenue / SR-60 Interchange". City of Diamond Bar. City of Diamond Bar. Retrieved February 20, 2016. ^ "State Route 60/Lemon Avenue Interchange" (PDF). Caltrans. January 2008. p. vii. Retrieved February 20, 2016. ^ "Lemon Avenue westbound onramp and eastbound off and onramp opening opening and Brea Canyon Road eastbound offramp closing". City of Diamond Bar. 2018. ^ a b "Caltrans District 8: 60-91-215 Interchange Project". Wikimedia Commons has media related to California State Route 60.